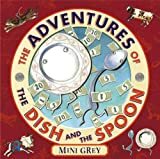 ..and the dish ran away with the spoon is the end of the nursery rhyme but is the beginning of the rest of the story in Mini Grey's take on the story. Dish and Spoon take off over the edge of a cliff and sail for New York City where they become a hit on the vaudeville circuit. Alas shopping at Tiffany, macy's and Bloomingdales and too many turns at the roulette wheel deplete their money. Also, a panel shows a new act, The Knife & the Fork are now a hit. Now down and out and living on the fringes (a broken cup sits begging against a run down building with a sign "Jug and 6 saucers to support," Dish and Spoon become victims of the Carving Knife Gang and in an attempt to repay their debt to the gang become bank robbers. Wanted for "unarmed robbery" they try to escape but Dish hits a rock, is captured and deported. Spoon is capture and jailed in Alcatraz before he is deported twenty five years later. 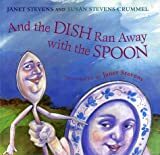 So Dish and Spoon run away at the end of the rhyme but now the story needs to be read again and the pair have not returned. Characters from other Mother Goose rhymes take off to find them. Little Boy Blue, a giant, the cow, and Humpty Dumpty all play a role. Crummel's characteristic humor is fun to read aloud. A lavish map allows young readers to follow the action. I often used this book as an introduction to map skills with my primary grades. Crummel's sister, Janet Stevens, paints quirky expressions and humorous situations that underscore the story. Children will enjoy finding Fork on each page as a sort of "where's Waldo/I Spy" entertainment. Visitors to Susan Stephens Crummel's website are invited with "Teacher Tips" to use along with her books. I love both of these books! Thank you for reminding me to use them together!